Today I got to the best part – cooking in the Pesachdike kitchen! I made 5 recipes of this cake, 3 in tube pans, one on a huge cookie sheet, and one as 3 9-inch rounds. As you already know, my mother is a cook and baker par excellence. She puts her heart and soul into the food that she makes and it shows! 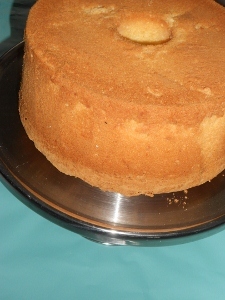 This is her famous, classic Pesach sponge cake. 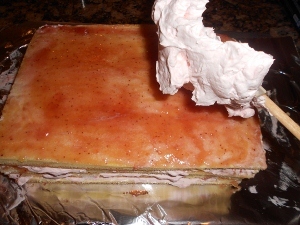 It is elegant served all on its own or you can turn it into a strawberry shortcake by layering with strawberry jam and strawberry whipped cream. Preheat oven to 350 degrees. Beat the yolks in a bowl with 1/2-cup sugar until pale yellow in color. Add the oil and orange juice. not dry. Fold into the yolk mixture. Pour into a 10” tube pan. Bake for 1 hour and 15 minutes or until toothpick inserted in center comes out clean. Turn the pan upside down to cool. Most tube pans have 3 “legs” to stand on. If yours doesn’t, turn the pan over and center the middle over a bottle that fits into the hole. 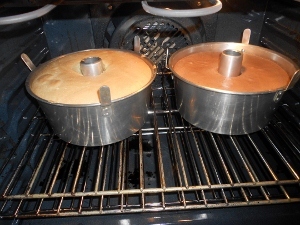 Once cool, freeze the cake before removing from pan. I was up till the wee hours trying to put the posts together. We cannot be in the kitchen and at the computer at one time. This sponge cake is versatile and definitely worth adopting! Ooh super excited about this. I’ve been pondering how to make a GF sponge cake. I will definitely be trying this out. One question, why freeze it before removing from the pan? Cakes made with potato starch have a tendency to collapse when taken out of the pan. Freezing it before removal is a great tip that increases the chances of your cake holding up. Good luck!